Water is life, image adapted by Jared Yazzie. 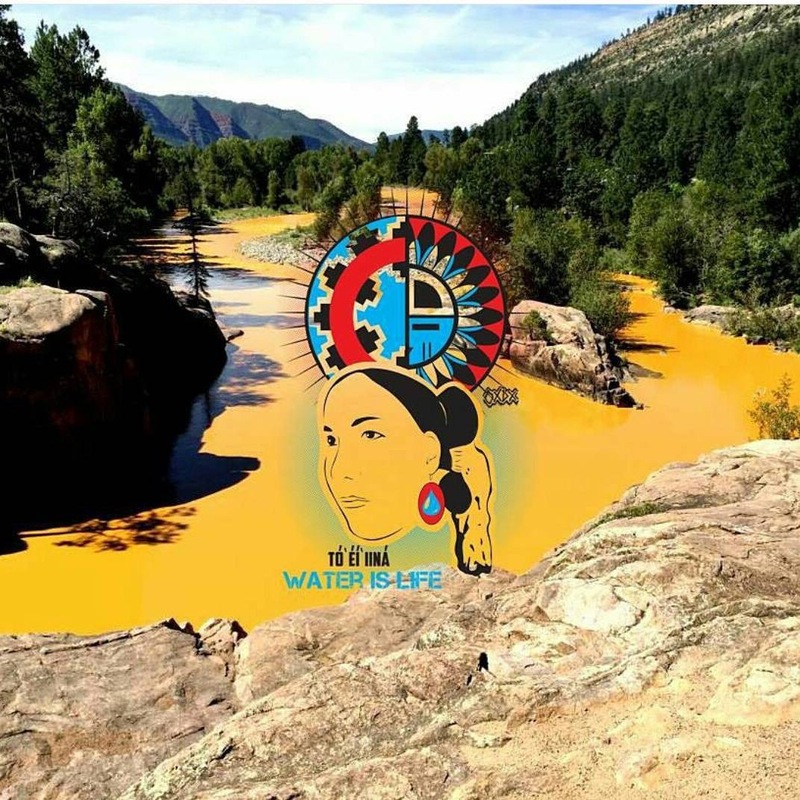 I watched a video of a fierce asdzaan Diné on Friday shed tears at the bank of the Animas River as she watched gallons of waste from a mine blowout in Colorado kill her beloved river. I read her posts via social media of the yellow-orange water leach its way deeper into Diné Bikeyáh. With each post, newspaper article or account, my heart caved. It’s taken me days to process, believe, begin to understand how fast the water from the mine oozed into the waterway. I remembered in one post this same woman pleaded for her K’é (relatives) to “go to the water and pray”. I carried those words around until tonight, when I was able to run along the canal here in the desert. With each step I prayed for restoration of the water’s spirit and the strength of people who fight for the water we have. As I ran I thought about how when I’m old I will remember the time the river turned yellow. In the same way people talk about the rock slide on Black Mesa before the Long Walk began, the way people talk about the rocks that have fallen from Monument Valley. Each of these events have communicated to us how out of sync we are with our mother earth, teachings and practices. But are we ready to listen? When will we be brave enough to act? These rivers are not the ones I played in when I grew up but I have those memories, in my community, on the other side of the mountain. I know the joy of being able to sink my feet into the shore of the river and feel the coolness of the earth in the heat of summer. I understand how refreshing it can feel to pray at the water and be reminded of the center of your being. I understand how safe being near the water can be. I thought of my recent trip home and how happy I was having found freshly cooked kneel down bread along the San Juan River. I thought about the water that gave life to the corn and how I found it on a day my soul needed to nourish itself with the tastes of the land. I thought of how when Ghąąjį’ (October) comes this fall, the harvest will be quiet. I thought of how my cousin will not be sharing in the crops of squash or even pumpkins for my home in Phoenix. I think of my close family friend who had memories of playing in the river with his cousins and whose animals will be thirsty now. Shí eí Táchiinii. I am of the Red Running into the Water people and tonight my heart aches for a river whose life has been taken because of recklessness. As a community we call ourselves Diné meaning “the People” and when we speak of humans – Bila ashlaííi or “five-fingered people”. Not only are we all connected by the curves of fingers but also by the foundation of water that allows the blood to flow through our veins. We are the water and it is us. If you can look at the photos of the damage and not feel anything then tonight I will not only pray for the water beings, the animals and plants, the people whose lives have been intertwined with these beautiful bodies of water for generations, but I will also pray for you. I will pray that you may find your way back to yourself. She said go to the water and pray…it is at the water where I found so much heart ache, where I was able cry but also give thanks because I can still hear the rushing water. I have hope we will rise in our awareness to protect the water’s preciousness. Tó’ éí’ iiná, water is life, let us carry this in our hearts because this truth flows through us. Water is life. That polluted water is going to keep going and going. I caught my first trout in the San Juan River. It was so clear and clean then. Every time I see photos of this disaster, I feel sick. This has hit me very hard, so I understand your words. Sending you prayers too. I can’t even find the words to say how beautiful and honest this post is! I am so thankful to have your insight and wisdom in my life. Thank you for your truth. The power of your words is match by the power of your memories. The real test of our people is what do we do now? Is this a wake up call or is it just another thing we complain about. Your words and memories help us wake up, stand up and remember who we are as Dine’. I pray for the water, for all waters all over Earth, I pray for all air and all ground. I pray for all life, the four-legged, the winged ones, those who stand and those who swim. And I pray for people, that they will finally wake up and change their way of life. That they stop to destroy our Mother. Thank you for your prayers, they are felt. Thank you so much for your kindness, it is power. I am still stunned by this spill that did not need to happen. The images are shocking! Your comments said beautifully thoughts for which my heart had no words! Thank you. Thank you Karen for your comments. I love the song!! Thank you for sharing and reading my words. My heart aches. Go to the river and pray. Ahé’hee Ruth for your prayers. Thank you for your deep words and memories. Here is another video with beautiful images and the song, Down in the River to Pray, with Alison Krauss. People all around the world are weeping. This song has been in my head all week. Sending you prayers too. Those are my hopes too. Let us all hope she does too. Thank you for sharing your thoughts.